A compact greenhouse that delivers form, function, and attractive design in one ready to install package. Great looking design, innovative features, quality construction and best-in-class value come standard. 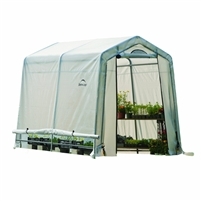 This decorative greenhouse is a perfect solution for starting seeds and extending growing seasons. Installs quick and easy with wing nuts and bolts at every connection point - no tools required. Grow It Organic Growers Greenhouse comes ready to install in one box. 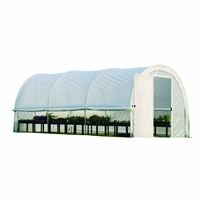 Grow and protect plants with this tunnel greenhouse for the experienced grower. High-quality design and superior strength makes it ideal for starting seeds, growing plants and extending growing seasons. Featuring metal Shelter Lock stabilizers for added strength and durability, the frame is constructed of DuPont powder-coated 1-3/8 in. steel with Easy Slide cross rails for a snug cover fit. The water-resistant polyethylene open scrim cover blocks harmful UVA and UVB rays. Zippered half-moon vents and roll-up side panels add airflow. 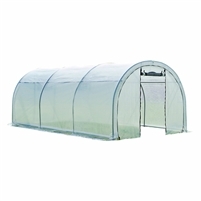 Grow and protect plants with this tunnel greenhouse for the experienced grower. High-quality design and superior strength makes it ideal for starting seeds, growing plants and extending growing seasons. Featuring metal Shelter Lock stabilizers for added strength and durability, the frame is constructed of DuPont powder-coated 1-3/8 in. steel with Easy Slide cross rails for a snug cover fit. The water-resistant polyethylene open scrim cover blocks harmful UVA and UVB rays. Roll-up side panels add airflow. 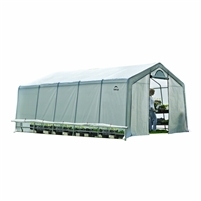 Grow and protect plants with this professional grade tunnel greenhouse. High-quality design and superior strength makes it ideal for starting seeds, growing plants and extending growing seasons. Featuring metal Shelter Lock stabilizers for added strength and durability, the frame is constructed of DuPont powder-coated 1-3/8 in. steel with Easy Slide cross rails for a snug cover fit. The water-resistant polyethylene open scrim cover blocks harmful UVA and UVB rays. Roll-up side panels add airflow and 2 Man doors. 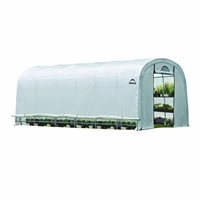 Grow and protect plants with this professional grade tunnel greenhouse. High-quality design and superior strength makes it ideal for starting seeds, growing plants and extending growing seasons. Featuring metal Shelter Lock stabilizers for added strength and durability, the frame is constructed of DuPont powder-coated 1-3/8 in. steel with Easy Slide cross rails for a snug cover fit. The water-resistant polyethylene open scrim cover blocks harmful UVA and UVB rays. Zippered half-moon vents and roll-up side panels add airflow. 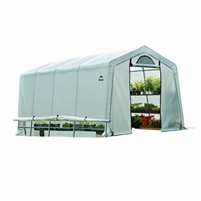 The Grow IT Heavy Duty Greenhouse with roll-up side vents deliver quality construction, quick and easy assembly and best in class value. Featuring 1 5/8 in. 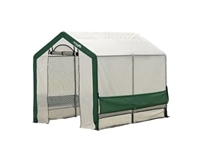 heavy duty all-steel frame, patent pending Shelter Lock Stabilizers, Ratchet Tite tensioning and the Easy Slide Cross Rail System for a stable and durable greenhouse. 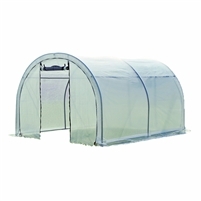 The specially designed Clear View triple-layer, heat bonded Rip Stop translucent cover provides enhanced illumination for plant growth and protection. Roll-up side panels and half moons screen vents at each end provide optimal airflow and temperature control. 30 in. Shelter Auger anchors come standard.